I have been meaning to write this up for such a long time. When I visited Iran I went to see how the rosewater is producted since they grow the most beautiful fragrant roses on the planet, the ones that are used for the most expensive perfumes in the world. So I decided to go via a tour as they take you to the right places. Every year loads of loads of people like to do this tour, to see the process and to then buy some of the new season gorgeous rosewater. In Iran they use rosewater for not only skin care but extensively in cooking to inhance desserts and sweets.It goes in pastries, ice creams and rice puddings. Off we trundled in a full coach to just ourside of Karshan, quite early in the morning so that we could see the rose pickers, which by the way is still down in the old time traditional way of hand picking! These have to be gathered pretty early so that the maximum secent is intact. We were then invited to see the process at one of the many little outlets in the streets that product the rosewater year after year. So here is the essence of the process. Distillation is done in large stills traditionally of copper are filled with roses and water. The still is fired for 60–105 minutes. The vaporized water and rose oil exit the still and enter a condensing apparatus and are then collected in a flask. This distillation yields a very concentrated oil, direct oil, which makes up about 20% of the final product. The water which condenses along with the oil is drained off and redistilled (in order to obtain the water-soluble fractions of the rose oil such as phenethyl alcohol which are a vital component of the aroma and which make up the large bulk, 80%, of the oil. The two oils are combined and make the final rose otto. The essence has a very strong odour, but is pleasant when diluted and used for perfume. Attar of roses was once made in Persia but is now mainly produced in the Rose Valley in Bulgaria. The hydrosol portion of the distillate is known as rosewater. This inexpensive by-product is used widely as a food flavouring as well as in skin care and this is largely what Iran now produces whilst the oil goes off to France for the perfume industry. Iran still produces its Rosewater in small family run factories which open out the street for anyone to come and see and learn about how it is made. You can visit the little producers during the season which is around May time, you can go with a tour to the area just outside of Karsharn, they will take you to the rose growing orchards to see the beautiful roses and then you will be given a tour with a talk where you will also be able to buy some lovely rosewater yourself. 10,000 roses to make 1x 5ml bottle of rose oil ! Wow thats a lot or rose growing and a LOT of picking! Well done chaps. Snails Kids is a new range of nail painting products founded by British mum Jeanette Sklivanou. Safe and fun to use, Snails (Safe nails!) are a completely unique, child friendly product.The only child polish to be 100% European, Snails is manufactured in France and is packaged in lead free Italian glass bottles. Snails adheres to all the regulations set out by the EU protective laws for cosmetics. They are available in 11 vibrant colours and they are made of just three ingredients: Water, Acrylic Polymer and Non Toxic Colourants. Snails are 100% soluble and so for any unforeseen spillages, this polish will simply wash away! There are also 3 quite neutal soft colours for mums to be ( or for anyone really) use top coat to keep it on for normal length of time. I have tried this myself and can verify that yes it does come off with a wash and yes it does stay on with the top coat. I loved the two colours I chose to try ( Candy floss & Raspberry Pie ) and will definately be using it again. We have a terrible misconception that we don’t look right in certain colours, you’ve heard it ... blue eyes blue eyeshadow, green eyes green eyeshadow. Well let’s put that aside for the moment. The main thing to remember is that there are no hard and fast rules but generally keep to the same colour group. This will help you blend and soften your colours. Pearly eyeshades are used to highlight the brow bone, they open up the eyes and create a shimmering. Frosted effect. Avoid really pearly eye shadows if your eyelids are very wrinkly because the pearly shadows will accentuate them. Matt eyeshadows create a nice flat effect. Dark shades retreat the eyes and light shades seem to advance them. Blend a pearly shade on top of a matt shade. What colours go with what? Pearly Greens: These colours include pale yellows, browns & golden colours. Super with jeans and black outfits. Really good with pink clothes and to give colour to black & white clothes. Matt Greens: Colours in this group include yellow, orange grass green & black & are very sophisticated, look best with the neutral colours of black and white to give a dramatic look. 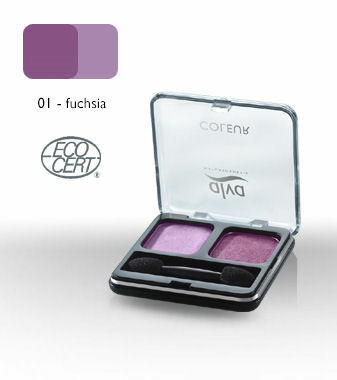 Matt blues & violets: These include all blues & violets , can be pretty and soft or bold and bright & even deep and sultry. Matt Pinks: This group has reds, pinks and white & these can give a sweet pretty innocent look or a passionate to classic look. Matt Browns: Gorgeous group of soft browns maroons, wine shades. Perfect for creating sculpted wide-eyed looks. Matt Oranges & yellows: This group is full of bright bold oranges and flashing yellow & dark reds. Colours for the bold because they make a great statement. Real fashion colours. Now endorsed by the fashionista of the Royals the Duchess of Cornwall sports a beautifull new henna tattoo. She wowed her audiance with a tattoo given to her byt the ladies in Zanzibar. Here she wears a cream coloured cool dress with beading around the neck and front, a matching handbag and cool pearl beads around her throat, finished off with a swirly tattoo on her hand, doesn't she look fab?? Eyeliner is the most ancient form of makeup used. It was discovered to be used widely in ancient Egypt and Mesapotamia, and used by both ladies and men. 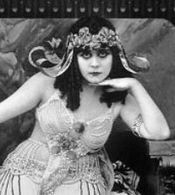 Eyeliner was used by King Tut. It is said that eyeliner used in ancient times could have been used to ward off the evil eye and to protect the eyes from the sun & other eye ailments. Many different ingredients were used in eyeliners, sometimes copper ore and lead. Thankfully our modern eyeliners do not contain these ingredients. Our 100% natural powder kohl is made from a a variety of nuts incl: almonds, walnuts, hazelnuts and pistachio & coconut, ground down and roasted in sesame oil to produce a gorgeous black soot. This is then traditionally applied with either a wooden or bone applicator. 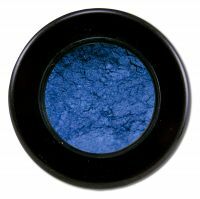 As well as this traditional powder kohl (sormeh) made in Iran are the more well known forms of eyeliner to choose from. These varying types of eyeliner on the market each give a different type of effect. Liquid eyeliner : a liquid which comes in a bottle and is applied with a thin brush to create a sharp defined line. Kohl : A soft powder eyeliner in matt shades. Kohl outlines the eyes and can come in a powder form or as a pencil, it is soft and easy to apply and is popular in the east. Also called Kajal. 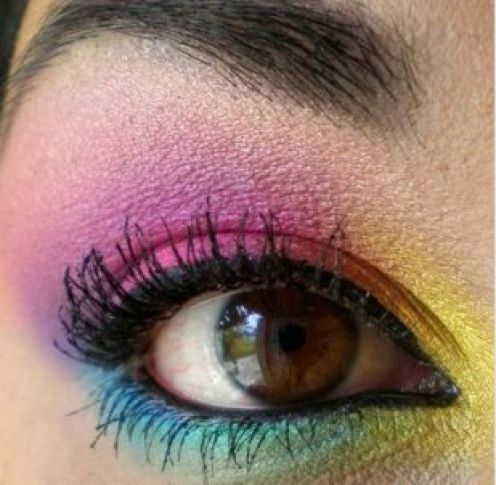 These are easier to use if you want to produce a smudged look too. Powder based pencil : This is a soft, powder base eyeliner in a wood pencil form, lots of colours available, matt shades and generally easy to apply. Wax based pencils : These are similar to the powder based pencils but are wax based and much easier to apply as they have added wax which makes the eyeliner very soft. Went off to the Natural & Organic Show yesterday and had a wonderful day, fun but exhausting. I met some some lovely people & caught up with some old friends. Found some great new products for you and will be introducing them soon. Mohdoh, those terrific mouldable aromatherapy delights has brought out a new one called Headeez designed for those suffering from headaches and tension. So watch out for this one. I will be adding some nice new natural makeup so that you have even more choice of branded natural cosmetics to choose from. One of our favourite nail polish brands, Suncoat, has a super new line just for kiddies. Its sugar based and totally safe for biting and sucking fingers. It peels off so no need for remover. I can verify the ease of this as I tried it and it comes off dead easy, and polish comes in fab jolly colours. These will be added soon. My 'piece de resiistance' is a fabulous new range of natural cosmetics that I am so excited about that I can't wait to get it into my own cosmetic bag! Its base is made from dried and crushed flowers, including rose petals. chamomile & jasmin, all organic & GM free. This company has producted a complete range of beautiful shades of eyeshadows and shades of foundation for all skin tones, liquids compacts & blush.The lip tints are some of the best I have come across. I tried this gorgeous range of cosmetics and was bowled over with the silky smoothness, staying power and luscious textures. I am convinced you're going to love these. I had super day at the natural & organic show & was exhausted when I got home with my bag full of info, samples and ideas. Choosing the right Lipstick can transform your look, lift your face & make you feel a million dollars. So check out the following and make a wiser and less error filled choice. choose a colour that compliments both your skin tone and your hair colouring. 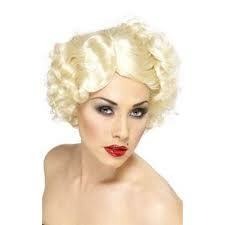 Each skin and hair type has a variety of lipstick colours that enhance. Don't think that there is only one or two choices, there are bright cheerful colours, subtle colours and browns to choose from. Have a selection in makeup bag to suit your mood of the moment. Arrived in Iran and been here for a week now. Its been very hectic and I don't know where the days go! I am staying in Pardis just outside Tehran. This is a new town in the mountain area and its very quiet and peacful. Its very relaxing to return there after a busy day in Tehran town. Bought some fresh henna, lotus (sedr) and ordered my cassia (senna). I now need to do a trip to the main bazaar to find other new thing to add to the shop. This place is terrific for all those lovely organic hair treatments and natural products and great for organic and health giving teas and medicines. I just get so excited when I am in the bazaars I want to buy it all! If anyone has anything they would like me to stock please send me an email and I will do my best to source. I bought myself some Lotus shampoo and some nettle shampoo today and can't wait to try it. I tried out Lotus shampoo years ago and loved it so am keen to see if it still works for me. watch out for my next post, the internet is somewhat irratic here so who knows when I can post again. You can't get away from it, Henna tattoos are here to stay. They all want one. The beauty is that you can have a tattoo and when its faded try a different design, place it anywhere on the body and its the most natural looking type of tattoo to have. R&B Singer Kelis sporting her gorgeous henna tattoo on her hand. Henna tattoo pens can be purchased here,they come in different colours and all contain only natural ingredients with no added chemicals.Great for a natural tattoo. Vanessa Hudgens also is an advocata of henna Tattoos is is helping to revitalise this ancient and beautiful art form. The actress showed up at the "Charlie St. Cloud" premiere, in L.A., with henna tattoos on the palm of her hand. Jessica Simpson is also sporting a super henna tattoo and is reported to say that they are supposed to be lucky for single ladies. so there you are girls .... get designing and get drawing!!! Eyebrows are the feature on face that define and give definition. Without them we tend to look kind of insipid and unnoticed. Unfortunately as we grow older the colour fades and they become less dense and defined which is why we spend so much time in recreating the perfect brow and why we so often get it wrong. Start at the tip of the eybrow and work outwards from the bottom, pushing upwards. fill in the arch and finishing with drawing on a tail at the end of the brow. We recommend the henna filled eyebrow pencil for a great natural look, works beautifully for filling in sparse hairs and giving long lasting staying power. Henna eyebrows has a precision tip for easy and precise application is totally natural, has no chemicals and will not irritate. 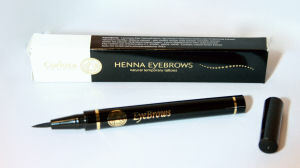 Henna eyebrows comes in 3 colours Black, Dark Brown and Light Brown.